Aluminum siding has become increasingly common in recent years. One of the primary reasons for its popularity is the durability, meaning it can last for years without much maintenance. While it can be true to some extent, there are still times when you need to maintain your aluminum siding due to significant impacts of the weather. Otherwise, it can make your house look quite outdated and less attractive. Fortunately, little effort is required to help you repaint your aluminum siding. As long as you know how to paint aluminum siding, you can complete it within several hours. But to reach that goal, you should check our recommendations for the best paint for aluminum siding! Can You Paint Aluminum Siding? The sun has a significant effect on your aluminum siding, which finally needs painting again. It is not a too complicated job, and you can do it on your own within a short period. It does not take as much time as wood siding. Besides, repainting it is much more economical than replacing it. Everything’s simple in this process. Metal siding can be smooth and spray painted. You do not need to roll the paint (but if you want, it is not a big problem either). Even though it is not difficult, you need to pay a lot of attention to the preparation process which plays an essential role in the final results. If you prepare the surface properly, the paint can last longer on aluminum than on wood. Many people have painted aluminum siding on their own, and after many years, the paint is still impressive. So, let’s figure out how to paint aluminum siding! Before understanding what the best paint for aluminum siding is like, you should have a comprehensive understanding of the process of painting aluminum siding. Are there any differences between aluminum siding and other types? Check our guide on how to paint aluminum siding as below. 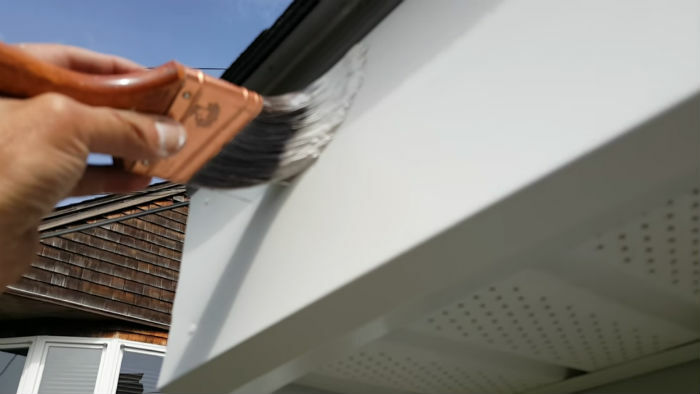 During the entire process of repainting your aluminum siding, preparation seems to play a vital role and is the key to determining your success. Therefore, it is a great idea to notice every single step of it. When you work with aluminum siding, it is very different from other metal materials or vinyl. Thus, experts recommend that you understand what you are facing. Oil-based paint is not suitable for galvanized steel. You can look for some paint manufacturers who provide multi-purpose enamel. Otherwise, you can find metal paint for the best outcome. Another factor to consider is whether you have repainted the siding or not. If you have, check the paint you used the last time and consult a professional about that paint if possible. Many people find it challenging to distinguish between aluminum and vinyl if your siding is brand new. In this circumstance, you should search for dings or cracks. If you find the latter, it is likely vinyl. Meanwhile, aluminum will show bumps or dings. In case you want to find out whether your siding is steel or aluminum, the recommendation is to use a magnet. It sticks to the steel, while aluminum does not have that ability. Besides, you can also notice red-brown rust in steel siding. Cleaning is essential because of several reasons. First, it enhances the primer, allowing the paint to stick to your siding better. Second, it contributes to a smooth finish. The suggestion is to get a power washer. If you wash from the bottom up, it may lead to some unwanted damage to your siding. In case you want to get some chemicals, you should start with rinsing the siding first to eliminate any remaining materials. Otherwise, residual chemicals may damage the painting. For stubborn stains, you can use biodegradable laundry detergent to remove them. Try using one-quarter of a cup of them and water (4 gallons). To detect chalking that usually appears on the surface after a long time of using, you can rub the hand along your siding. Seeing a powdery substance should not make you worried. It is chalking. The powdery substance can be considered as a self-cleaner. In this case, a detergent which has TSP would eliminate the chalking easily. The primary purpose of repainting your siding is to give your house a completely brand new appearance. On the other hand, you also want to fix issues which might affect the quality of your siding. Paint does not help you deal with blemishes on your siding. When you find peeling paint, you need to remove it so that your siding can have a smooth look. If you find severe damage, it is crucial to consider replacing with a new aluminum siding. Some problems are too big to be handled only with paint. You ought to consider using a power sander. It is dependent on the area you need to paint. Rough sandpaper is excellent for the beginning, and a fine is good for finishing. It is necessary to stay away from and not damage special molding and etches. Those who get a power sander should be careful to avoid any possible damage on the siding. Besides, you should not use sandpaper below 80 grits because it is responsible for a lot of permanent damage on the metal surface. You need to carefully pick these tools to have the best result after the entire process. As it is unnecessary to repaint your siding so often, you do not need to buy a washer. Ask friends or neighbors who are likely to have one. Otherwise, you can rent it at a reasonable price at many hardware stores. You may also want to be concerned about other safety tools, like goggles, ear protection, gloves, or waterproof boots. Oil-based primer is necessary because it helps to absorb chalking pigment on your siding. Furthermore, it protects your siding’s surface from external substances. An acrylic primer is a great choice thanks to its strong base. It does not cause possibly missed oxidation. However, you need to be careful with this primer as it goes well with only acrylic paint. Latex primer, on the other hand, should be avoided due to its content of ammonia. This substance possibly results in premature failure and damage of the paint. The weather should be taken into consideration when it comes to painting your aluminum siding as well. If the weather is hot or cold, it can affect the speed at which paint dries and therefore how the paint sticks to your siding. Even though each paint indicates its acceptable temperature range, you should remember not to paint when the weather is less than 10 degrees Celsius or rainy. Before painting or priming, remember to start in shaded areas first. If you paint the siding affected directly by the sunlight, bubbles and cracks may happen as a result of drying too quickly. Coat the roller in primer before rolling it quickly and evenly on the siding. Then, continue backward, but in the opposite way this time. Doing so allows you to apply an entire and even coat. Typically, you just need several seconds to complete applying primer on an area of a foot. Full coverage should mean you use more than two coats. If the primer makes it impossible to see your previous paint or your metal, do not be panic! The coat should be visible to the naked eye, but still thin enough for quick drying. The key is to prime at an end. Whether you would like to work from right to left or vice versa, it is alright. Beginning in the middle seems to make the primer uneven after that. Give enough time so that the coats can be completely dry. Failure to wait can lead to bubbling or peeling. Dripping paint is a sign that you are having too much. You ought to start from the top so that dripping paint does not have unwanted effects on the final work. When you deal with horizontal siding, start painting from the left. For vertical siding, you should start from the top to guarantee that coats are even and you will not miss any places. The average time for paint to dry is around two hours. If you want to check whether it is dry or not, get your finger to touch it a little bit. No feeling of sticky or tacky is a sign of full drying. Then, you can move to the next stage – the second coat. After the first coat, if you notice any bumps, eliminate them immediately with another sanding. You need to be careful because too hard actions can turn your first coat into nothing. The second coat is not compulsory, but it contributes a lot to the professionalism of your house. It also has enormous impacts on the paint durability. So, don’t skip it! When lines appear in the first coat, it implies that you are doing everything too slow. The second coat can fix it correctly as long as you do it carefully. One of the essential factors you need to take into consideration is the paint you use for aluminum siding. Not all of them are suitable for this type of siding. Some ought to be acrylic. Also, you might want to read its label to know whether the paint should be applied to aluminum or not. Typically, the best paint for aluminum siding should be acrylic exterior grade as it tends to last over a longer period and protect your house more efficiently. High gloss paints, in contrast, are a terrible example because they reflect the sun’s glare. What Is The Best Way To Paint Aluminum? There are many methods of painting aluminum, and you might be wondering what the best way to paint aluminum siding is? A sprayer or brush can do the job. Or you can use a roller, as long as you know how to paint aluminum siding with a roller. The essential thing is not about finding out the best way to paint aluminum, but how you do it. Brushes are the most economical way, but they will cost you a lot of time to finish the work. Meanwhile, the opposite is true of a spray machine which saves time but costs much. Therefore, a roller is a popular option for many people thanks to its moderate cost and simplicity. Let’s find out how to paint aluminum siding with a roller! If you choose rollers, make sure that you use a lambswool roller. In the case of brushes, it should be synthetic fiber. Both of them play a vital role in helping you get a smooth finish. Another way is to use a sprayer. In this method, you can find a professional machine to help, but do consider the availability and price before making decisions. In brief, giving your house a completely new look sounds like a great idea, and you can start it on your own immediately! Repainting is not a challenging job, but for aluminum siding, things can get a little bit trickier. We have collected a series of studies and people’s experience to create the ultimate guide on how to paint aluminum siding with the best paint for aluminum siding. We hope that it would be helpful for you when you decide to make your house look more attractive and professional!